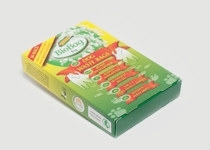 BioBags are biodegradable and compostable bags for rubbish disposal. This 10L liner fits the Max Air bin. BioBag bags replace plastic and can be disposed of in composts or green waste collections. They can be used in organic farm production and food contact applications. Manufactured from Mater-Bi; the first family of bioplastics that use vegetable components such as starch, cellulose and vegetable oils and biodegradable polymer and natural plasticizers, all crops used are non-food origin. Also some of these crops are grown to assist in remedial land recovery. To be more specific, the oils are from weed seeds grown on marginal wasteland in a European Union country and specifically no Palm oil. All grades are compostable and biodegradable during composting and include sustainable and renewable resources. Heavy duty bin with secure clip lock lid and strong carry handle, UV stabilized for outdoor use. Use with certified compostable 35L BioBag liner, ideal for food scraps and for curb-side collection. Strong and durable to hold food and garden waste. BioBag bags can be disposed of in composts or green waste collections. They can be used in organic farm production and food contact applications. Manufactured from Mater-Bi; the first family of bioplastics that use vegetable components such as starch, cellulose and vegetable oils and biodegradable polymer and natural plasticizers, all crops used are non-food origin. 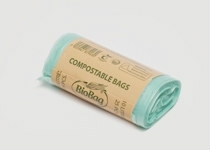 BioBag's are certified compostable in home and commercial composts and may be placed in a green waste collection. The Mater-Bi material breaths so CO2, O2 and water vapour transmission rates are high making bags very suitable for keeping produce fresh, no sweating with food or skin contact applications. They maybe used for food contact applications with high resistance to fats, oils and acidic foods. Safe for animal feed like worm or pig farms, even sea creatures can digest BioBag's. The decomposition rate depends on bacterial activity, the temperature and the moisture level; in hot quality compost BioBag's will decompose much quicker than the international standards (180 days) with no polymeric or toxic residue. Use with 80L Tie Top BioBag liner, that is certified compostable, ideal for food scraps. Our 40L Wheelie Bin was especially designed for commercial kitchens, with fold away handle to allow under bench storage and wheels to allow for convenient handling even when full, large handles make it easier to lift and tip into a skip. Organics are heavy so bins over about 40L require mechanical lifting devises. 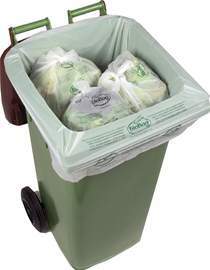 Our bin is robust, hygienic, easy to clean and also fits a BioBag compostable liner. The BioBag liner is approved for organic farm input and animal feed with tie top corners for easy transfer to compost sites, worm or pig farms or a green waste collection. 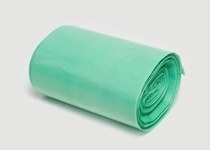 Specifications: Material: Polyethylene – 530 mm x 460 mm x 650 mm high – Colour: Green – Fits 80 Litre Tie Top BioBag liner. 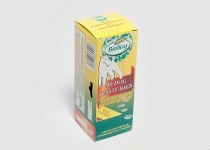 A convenient way to store and dispense our compostable 5L BioBags quickly and easily. Sturdy, attractive stand, designed for two rolls. Great for supermarkets, produce merchants, markets, and health food stores. Manufactured from Mater-Bi; the first family of bioplastics that use vegetable components such as starch, cellulose and vegetable oils and biodegradable polymer and natural plasticizers, all crops used are non-food origin. 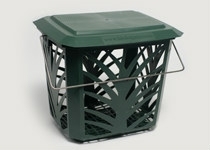 Strong and durable to hold food and garden waste. BioBag bags can be disposed of in composts or green waste collections. They can be used in organic farm production and food contact applications. Manufactured from Mater-Bi; the first family of bioplastics that use vegetable components such as starch, cellulose and vegetable oils and biodegradable polymer and natural plasticizers, all crops used are non-food origin. Also some of these crops are grown to assist in remedial land recovery. To be more specific, the oils are from weed seeds grown on marginal wasteland in a European Union country and specifically no Palm oil. All grades are compostable and biodegradable during composting and include sustainable and renewable resources. The MaxAir and TallAir bins are hygienic and easy to keep clean eliminating the ‘Yuk factor’. If a collection bin system is used the BioBag liners also keep these bins clean encouraging long-term participation. This prevents the need for extra labour to clean and excessive use of detergents and water; also collection bins are typically washed outdoors polluting storm water and streams. MaxAir Bin, the worlds best kitchen food scrap collection system, removes the yuck factor. Use with 8L certified compostable liner. 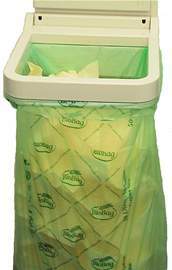 It consists of a small-ventilated bin with a unique BioBag liner made from starch based material designed to 'breath', allowing oxygen to reach the organic waste so the contents decomposition aerobically. 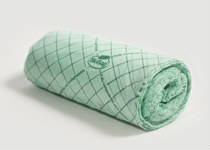 This minimizes odour, moulds and flies while still an effective barrier against bacteria and viruses. Bin ventilation also allows moisture to evaporate through the bag wall dehydrating the contents by around 20% for the average family. With water content reduced the waste is better conditioned for handling and composting. The MaxAir bin is hygienic, easy to keep clean without the excessive use of detergents or water as with regular bins. The 'reduced' contents, bag and all can be placed in the compost or a green waste collection system. The bins have a flush wall-mounting slot or are typically used under or on the bench top. Everyone loves the MaxAir bin system; we constantly receive only positive feedback and confirmation that 'it really does work so well'. Fits 8 Litre BioBag liner. The world's best portable toilet: chemical free, durable, lightweight and folds away to a very compact size. 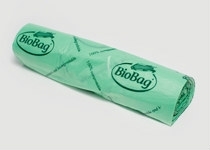 The no smell BioToi has specially developed BioBag liners, certified disposable in any sewage system or septic tank. The compact, lightweight and portable folding toilet with disposable bag liners. Made to NATO standards in conjunction with the Norwegian army, it is designed to be functional, hygienic and easy to use. BioToi is a convenient, hygienic replacement for chemical toilets (the bag covers the entire seat) and boasts no chemicals, no mess, no cleaning and no smell. The BioToi toilet and waste bags are perfect for home and business emergency kits, remote organisations, camping, boating, hiking, hunting, RV's and other related outdoor activities. 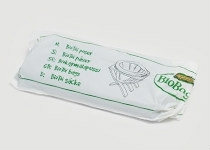 The BioToi waste bags are pigmented with instructions for use printed on them. A Friendlypak Desk Cube, lined with a BioBag compostable liner, is all that is needed to revolutionise waste collections within the office and business environment. Manufactured from Mater-Bi; the first family of bioplastics that use vegetable components such as starch, cellulose and vegetable oils and biodegradable polymer and natural plasticizers, all crops used are non-food origin. Also some of these crops are grown to assist in remedial land recovery. To be more specific, the oils are from weed seeds grown on marginal wasteland in a European Union country and specifically no Palm oil. All grades are compostable and biodegradable during composting and include sustainable and renewable resources. 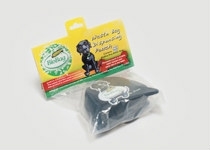 BioBag Dog Waste Bags do not contain any polyethylene-based ingredients. They are as natural as dog waste and decompose within 40 days in a well-functioning composting environment. By comparison, it takes more than 100 years for normal plastic bags to decompose. The logical solution is to use BioBag Dog Waste Bags, which are fully Compostable and Biodegradable Bags. The bags work well with wall mounted dispenser. Individual pouch (no bags) $2.20. Biodegradable generously sized bag on roll to fit most roll dispensers. These are a great option for Dog Clubs. Use with your own dispenser or use our pouch system. Perfect for fruit and veges. Manufactured from Mater-Bi; the first family of bioplastics that use vegetable components such as starch, cellulose and vegetable oils and biodegradable polymer and natural plasticizers, all crops used are non-food origin. Also some of these crops are grown to assist in remedial land recovery. To be more specific, the oils are from weed seeds grown on marginal wasteland in a European Union country and specifically no Palm oil. All grades are compostable and biodegradable during composting and include sustainable and renewable resources. Carton 1500 bags (5 rolls of 300 bags) $185.00. Separate up to 4 waste streams with the footprint of only one bin, UV stabilized for outdoor use. Use with 80L Tie Top BioBag liner, certified compostable, keeps bins clean. A tower of colour coded stackable bins with a foot print of only one bin makes it easy to separate waste at source, with each bin and colour identifying a separate waste stream. The result is an increased quantity and better quality of recovered resources rather than mixed contaminated waste sent to landfill. Fits 80 Litre Tie Top BioBag liner.